Outdoor Benches Add Style And Comfort to Your Outdoor Living Area. Here Are The Best Ideas at The Best Prices! Outdoor benches all have one thing in common. They all provide a place to sit, well, outside! If that's all that matters to you, just pull up a stump and relax. If you want to be a bit more comfortable and present a bit more style, may you should think a little deeper. There are essentially three variables to consider regarding outdoor benches; style, comfort, and materials. In other words, does it blend with your outdoor living area? Does it feel good when you sit down? Is it made of materials that suit your taste and ability to maintain? There are hundreds of options so you should be able to find pieces that work for each concern. So let's look at each area separately. Outdoor benches can be very basic and plain or they can be intricate and ornate. Part of that is determined by the materials used - metal can be formed into patterns that wood can't. While this is a matter of taste, some models are clearly designed to be placed in a garden, or by a backyard pond. The small butterfly bench shown here is essentially a piece of art which you can sit on. It would look great in the garden, but would be out of place on your deck. 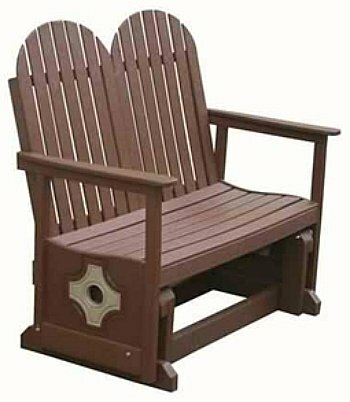 A teak bench with cushions would be much more suited for a deck or patio. There are benches made just for kids - perfect for making them feel welcome in your outdoor areas. For real outdoor comfort consider the glider bench and rock your cares away. With a very few exceptions, most outdoor benches are made of either wood or metal, or a combination of those two. Some benches are made of composite material (wood and plastic blended) but this is essentially a substitute for wood. The most common woods used are teak, cedar, mahogany and treated oak. The oak requires treatment because it is not naturally resistant to weather and insects like the others are. These materials are discussed more in depth in my article on deck materials. Other woods like cypress and bamboo are also available, but are not as common. All are beautiful and durable, but you should be aware of the characteristics and maintenance requirements of each. Metal benches are usually either wrought iron, cast iron, or cast aluminum. All of these are great options, but wrought aluminum is much lighter and will not rust. Be sure the paint is applied as a powder coat due to its smooth finish and high durability. 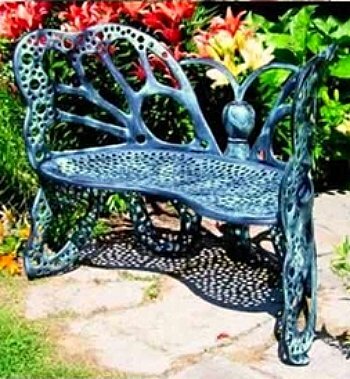 As mentioned, metal can be formed into decorative and ornate patterns, adding a great deal of interest to your bench. A combination of wood and metal can create a great looking bench. The two materials contrast with and compliment each other. 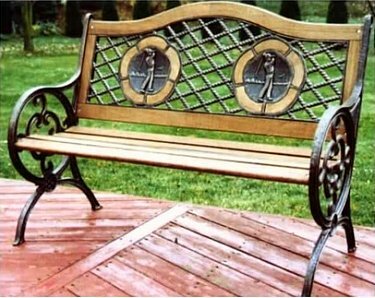 Outdoor benches are available in themed styles as well. Sports, wildlife, flowers...the possibilities are endless. 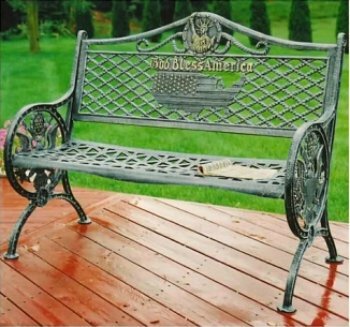 One of my favorites is the Americana themed bench shown here. Some outdoor benches are clearly designed more for appearance than for comfort. But that's okay, as long as you keep that in mind when choosing your bench. A small decorative metal bench next to your flower garden isn't likely to be as comfortable as a large teak bench with thick padded cushions in the corner of your deck. But you aren't likely to spend as much time sitting in the garden as you do on the deck. Just think about where you plan to put the bench and how you plan to use it before you make the purchase. Cushions can be added to any bench, but that can completely change the appearance of the bench. Some benches look great with cushions, while others look totally out of place. Consider the contour and height of the backrest if long term comfort is a primary concern. A contoured backrest is usually more comfortable than a straight backed bench. A higher backrest provides more back and shoulder support than a low backrest does. Again, this may not matter that much unless you anticipate extended periods of sitting on the bench. If you are planning seating areas for an outdoor fire feature, you and your guests may sit and enjoy the outdoors for hours. Other uses may only need to serve as a place to get off your feet for short periods. You are the best judge of how important long term comfort will be for your outdoor seating.